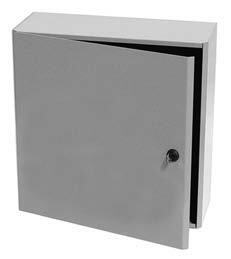 These general purpose enclosures are designed to provide a convenient method of surface mounting and protecting either pneumatic or electrical control devices. The ease of wall mounting, plus a subpanel on which the control devices are mounted, permits installation of the cabinet during construction and mounting of the finished subpanel at the required time. The cabinet may be either left or right handed door opening without additional hardware. NOTE: THESE ARE THE MOST POPULAR CONTROL CABINETS. There are many other sizes and configurations of control cabinets and enclosures. When ordering, please have the following information: 1. Dimensions you need (HxWxD); 2. NEMA rating; 3. Hinge type and swing; 4. Type of backplate, if needed; 5. Cabinet material (Steel, Aluminum Clad, Poly). ACCESSORIES: DIN rail, wiring duct, snap track, terminal strips, relays, surge protectors, transformers, etc. If you don't have the time to do it yourself, our panel shop can build a complete panel to your specifications.